"Kids need access to good water in order to be healthy and have time for school. We want to help people in Africa who don't have access to clean, healthy, fresh, yummy, delicious, stupendous, drinkable water." 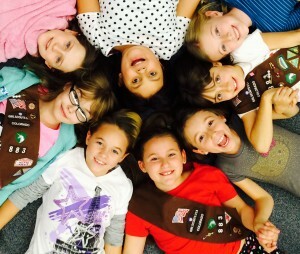 The Brownies have already raised over $500 selling craft items they made at local sales! Please consider supplementing their efforts with an online contribution. 01/05/15 Anonymous $115.00 Good job, girls. Donation in honor of Allison Cepull. 01/01/15 Mark Cepull $100.00 Given in honor of the extended Cepull family. Congratulations to the girls of the Brownie Unicorns for their success in fundraising! 12/14/14 Anonymous $50.00 Good job Brownies! Very proud of you! 12/04/14 Carol Jaffe $46.00 It is a great cause - good luck with your craft show, too!